Globe introduced another exciting promo for its postpaid subscribers -- Globe My Fully Loaded! For those who missed the former Globe My Super Plan, maybe you can find a plan that will suit your needs at My Fullyloaded. At a glimpse, subscribers can choose any all-consumable plan and add FREEBIES! Step 1: Choose your all-consumable plan! Step 2: Boost it with FREEBIES! Step 3: Add a FREE handset! Here are the 10 international destinations for freebie C: US, Canada, Guam, Hawaii, Alaska, Singapore, Hong Kong, China, Taiwan, and Thailand. For Plans 299 and Plan 499, you may also choose E using P100 from your consumable load. Each freebie and consumable amount shall have a term of 30 days from date of activation. Unused freebies and consumable amount will not be carried over to the next month. Enrollment to the Globe My Fully Loaded plan freebies will auto-renew every 30 days unless subscriber opts-out by going to the Globe Store or calling the hotline at 7301000. Request for change in freebie should be done 4 days before or after your cut-off period reflected in your bill statement. Availment of a free handset comes with a minimum of 24 months subscription period. Subject to Proof of Financial Capacity submitted. Plus Free 150KB covers both Internet APN and Blackberry APN. Rate in excess of free KB is P0.15/KB. 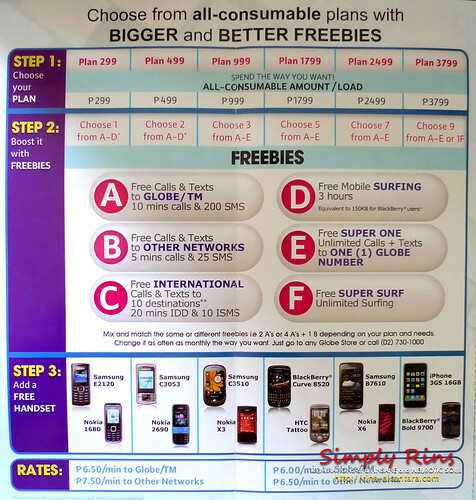 An activation fee of P450.00, valid for 1 month, is required to be able to activate freebie D for Blackberry users. ALL-YOU-CAN mobile services applicable to calls and text to Globe, TM, and Tattoo subscribers. Globe My Fullyloaded plans is another mix and match option for postpaid subscribers. This promo will run until August 31, 2010. Kudos to Globe Telecom for this new set of fully loaded postpaid plans. The company seems to be forgoing a large chunk of profits to give back more value to subscribers. That's fantastic news for us consumers! I don't think so. Globe sometimes gives headache. Service sometimes are not good, can't even assist customer sometimes. Globe are just playing us.